← What’s growing in Tate Modern’s Turbine Hall? Pasadena, CA — The Norton Simon Museum presents Fragonard’s Enterprise: The Artist and the Literature of Travel, an exhibition that presents 60 drawings created by a young Jean-Honoré Fragonard (French, 1732–1806) during his first and most important stay in Italy in the mid-18th century. These exquisite works document Fragonard’s voyage to see the great artistic treasures of Florence, Bologna, and Padua, among other cities. Fragonard’s Enterprise explores the excitement of this expedition, the documentary and practical value of the drawings, and their history following publication, especially as they were treasured by later collectors. Before Fragonard ascended to the ranks of one of the 18th century’s most popular painters, he studied at the French Academy in Rome, where he practiced the fundamental art of drawing as a method to hone his skills and to establish his own unique style. In Rome, he encountered his first patron, Jean-Claude Richard de Saint-Non (1727–1791). A passionate advocate of the arts, Saint-Non was an eager participant in the Grand Tour, the educational pilgrimage to Italy then in vogue throughout Europe. His voyage, made from 1759 to 1761, inspired him to chronicle this experience for an audience that shared his fascination with the peninsula. Saint-Non invited the young Fragonard to join in his tour through Italy’s illustrious cities. In exchange, Fragonard was tasked with making copies after the important paintings and monuments to be seen in the churches and palazzi. 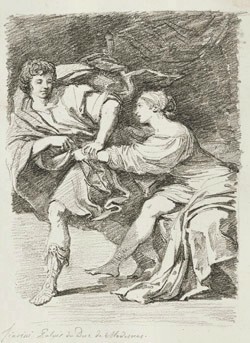 The black chalk drawings Fragonard produced for his sponsor served as source material for Saint-Non’s engravings and aquatints, which were published in suites, and in his illustrated travel bookVoyage pittoresque de Naples et de Sicile (1781–86). These immensely popular publications served as barometers of taste for the arts, and as beloved reminders of the masterpieces visited. Further info . . .